EARN UP TO $12.50 USD FOR EVERY SALE YOU REFER TO US! 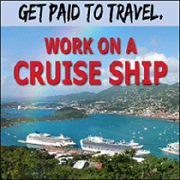 Thank you for your interest in becoming an affiliate of HowToWorkOnACruise.com. First, I wish to assure you that our unique and proven “Cruise Ship Employment Guide” is a product that you can be confident in promoting. It reaches a specific and ever-growing market, it offers a real solution to a real problem and the feedback we’ve received has remained 100% overwhelmingly positive. And with the one-of-a-kind bonus that we throw in, this product never disappoints. In addition, you’ll find that our team is fully dedicated to assisting our affiliates in every way we can. Our goal is to ensure that your participation in our affiliate program brings you the greatest rewards possible. If you’re ready to begin, kindly fill in your name and email address in the form below. Once you’ve registered, we’ll immediately send you an email with the link to our Affiliate Center, where you’ll find the simple instructions you need to start earning commissions right away. You’ll also have instant access to a variety of professionally-made, Google-standard advertising banners that you’re free to use in your promotional efforts. You can also be confident that all communication you will receive from us will be designed to help increase your sales and keep you informed about any updates we add to our product and/or advertising materials. No spam, no nonsense at all.